Summer weather has FINALLY arrived here on the prairies, and we’re soaking it all in! My latest Prairie Messenger column is about the necessity of leisure in our lives. We all need time to step away, reflect, and re-create. Enough of the work….let’s play! Pope Francis decides not to spend summer at Castel Gandolfo | National Catholic Reporter. Shhhh…..don’t tell hubby this piece of news! Many years ago, when our kiddies were still young, we bought a cabin to use as a vacation home. With five children, our holiday options were limited. We found out quickly that camping was not our thing. Travel and hotels were not only costly with our crew, but it often left us exhausted. As hubby would say, we were just “taking the show on the road”! The cabin became our second home. It surrounded us with familiarity while getting away from it all. In recent years, hubby has pushed to sell the cabin. He believes that having a second home is excessive. (No arguing there….it is a luxury that I don’t take for granted.) I claim that it is now becoming even more valuable as a vacation retreat for our growing family; a place where we can gather for fun in the sun with the clan. I used to argue that even the pope had a “cabin” for the summer. Granted, Castel Candolfo was a far cry from our get-away. And, the Vatican kept up the expenses basically for the use of one person and his entourage. We were sharing our place with many, making it all the more practical and viable. Pope Francis continues to impress us with his simple and humble life-style. It thrills my heart to see him refuse the trappings and pomp of previous papacies. But, I am a firm believer in the need for holy leisure. Francis will be curtailing many of his normal duties during the summer months in the Domus Sanctae Marthae. But, we all need time to rejuvenate. We all need time to get away. Perhaps a few weeks in the brutal heat of a Roman summer might change his mind. Today is Palm Sunday. With the early Easter this year, we are still in the midst of winter. Each wee hint of spring mocks us. The grocery stores are well stocked with tulips, but we know another snow storm or two are probably around the corner. It´s been a long and brutal winter, and spring yearnings are deeper than usual. Stepping into church this morning, we were welcomed by the most subtle of smells. The piles of fresh, green palms awaited us. I happily took the frond that was offered to me, and immediately lifted it up to my face, breathing in the greenness with delight. 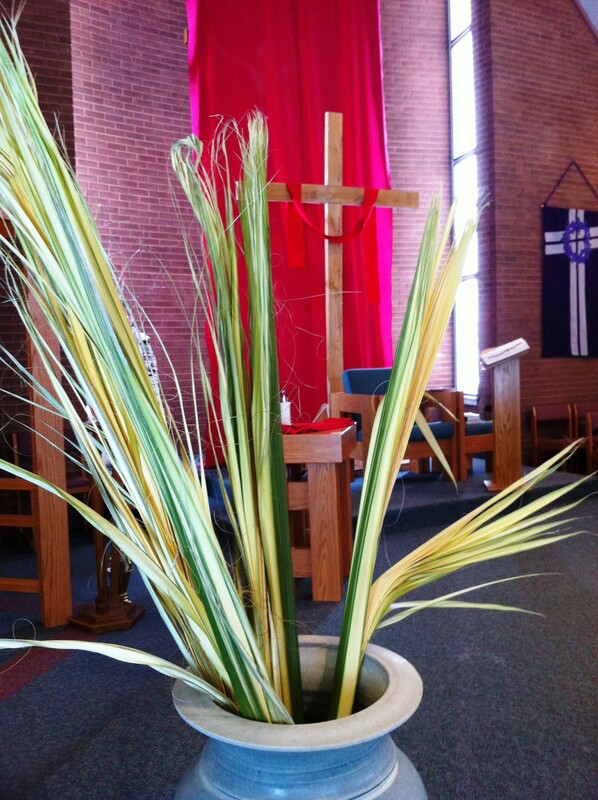 There is a simplicity and beauty in the symbolism of Palm Sunday. After the sombre purples and bare branches of Lent, the red cloths and green palms are a welcomed burst of colour. Perhaps we appreciate them more because of their simplicity. They gently nudge the senses, without over-powering them. Simplicity surrounded Our Lord as he made his triumphant entrance into Jerusalem. His ride was a donkey. Waving palm branches welcomed him – green fronds plucked from nearby trees, nothing ornate or expensive. What followed was a journey of accusations, humiliations, denials, torture, agony and death. The Hosanna moment was quickly forgotten, and the crowds turned on him. A crown of thorns and a cross for a throne became the ultimate paradox of glory, of true kingship fulfilled.